This Batman Black and White by Tony Millionaire Statue comes to you from famed illustrator Tony Millionaire (Sock Monkey, Maakies). The sensational statue captures the Caped Crusader exactly as seen in the Bizarro #1 comic, including his extra-pointy bat ears and fierce scowl! Batman is dressed in his black cape, gray Batsuit, winged boots, and utility belt. Made of resin, he's a limited edition that stands about 6-inches tall on a Batman Black and White display base and comes hand-numbered in a closed box. "The Bat-Man" is a cloaked specter bringing bizarre justice to the lawless and your collection! Ages 14 and older. 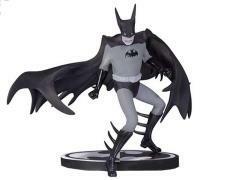 Add to your Batman Black and White statue collection.